Boundaries are technically not there. We believe boundaries exist between us and God. We view God as infinite and ourselves as in a finite box, and we often think God is everywhere except within the boundaries of our circle of self. Lets look at boundaries from the point of view of consciousness. Just after 500 BC the Greek Zeno, asked if for an arrow to hit a tree doesn’t it first have to go halfway? And from there does it not have to go halfway to the tree again? Does it not then traverse an infinite regress of partial flights? Does it ever hit the tree? Zeno’s paradox has bedeviled impractical people since then. The physicist Werner Heisenberg proved in 1927 it is impossible to know simultaneously both the position and the momentum of a subatomic particle. It’s usually called Heisenberg’s Uncertainty Principle, but I beg to differ a little. Because in accordance with the rest of the thought systems in this account of god, it must be so. Itzhak Bentov in his1977 book Stalking the Wild Pendulum, On the Mechanics of Consciousness extended this finding of Heisenberg’s by imagining a pendulum swinging back and forth. He analyzed what happens to it at the top of its arc, imagining it slowing down and slowing down at the top of its swing until like Zeno’s arrow it is traversing distances as short as those in subatomic space. Bentov shows that at the point where the pendulum reverses its direction we obviously know it’s momentum exactly, it is zero. And then in accordance with Werner Heisenberg’s uncertainty principle, Bentoz asks himself, then what do we know for certain about its position? None of us would suspect a lowly arrow not arriving at its target either, and perhaps for a different reason, because its target doesn’t exist; please see below. For our purposes here we are interested in what Bentov’s ideas say about boundaries. Imagine a boundary exactly at the top of a pendulum’s swing. Just as the pendulum is about to touch this boundary, in quantum space, the boundary is not touched because the pendulum cannot be shown to be there then. The pendulum cannot define a boundary location it is incapable of touching. Next is another discussion of the insubstantial nature of boundaries in consciousness. 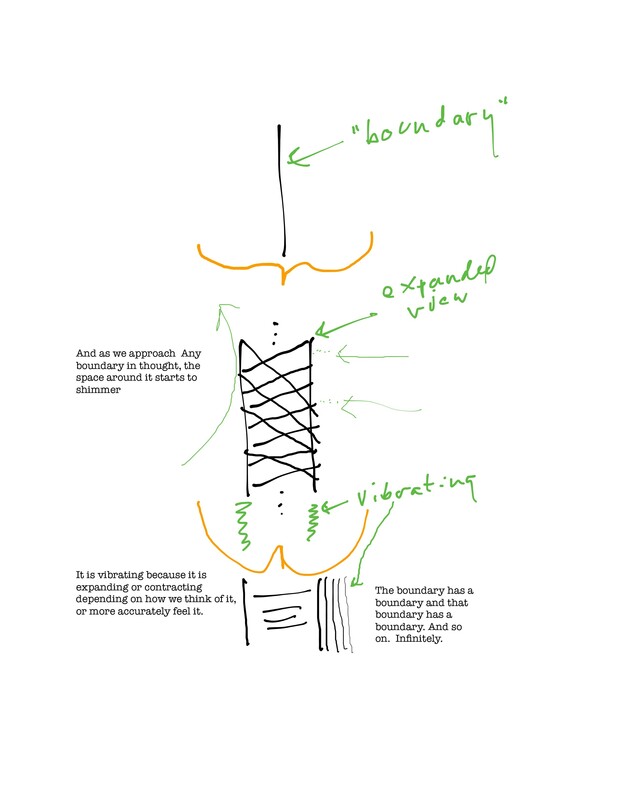 If we expand a picture of an innocent looking boundary and examine it deeply and thoughtfully, it can be seen that trying to intuitively touch a boundary is intellectually tricky. Please hold on here, but at the boundary of our expanded boundary in the picture below, is there not a boundary? And at the boundary of that boundary is there conceptually another boundary? The edge phenomena along a conceptual boundary are, well, edgy. Perhaps we cannot be sure about them. It seems that the “extra” boundaries attached to the side of each boundary are seen to possibly be there, but at the same time seen to be inextricably part of the ‘original’ conceptual boundary and not having an independent status. In our thoughts the additional edges may seem to come and go. They may essentially seem to somehow shimmer in and out of validity. This gives the feeling of consciousness shimmering around assumed boundaries. To the unbounded state of consciousness all boundaries appear optional. And shimmering with a glow of, truth to say it, “uncertainty”. The nature of a boundary no matter where found in consciousness seems to shimmer. It’s thereness, it’s assumed reality, comes and goes. And if the edge of the edge comes and goes, the boundary expands and collapses. It fully disappears and fully returns. You can play tennis on boundaries, basketball, and so on, without giving them a thought. But when you do give them a thought, you just can’t trust a boundary all the way. You can trust them only up to a point. An asymptote is a line that approaches a boundary but never touches it. It smoothly sidles up to a single other line but can’t by its mathematical nature go beyond it, or even touch it. This analysis we can prove, and it depends on our understanding of non-quantum tools of the regular universe we see and manipulate, not proofs of uncertainty in the quantum world. 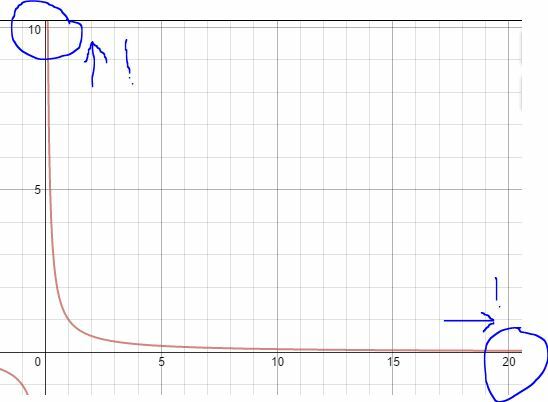 To show how asymptotes work, we can look at points on a graph. Each point has an “address” based on its location on a grid. The address is two numbers, the first how far over the point is horizontally; the second is how far up it is vertically. 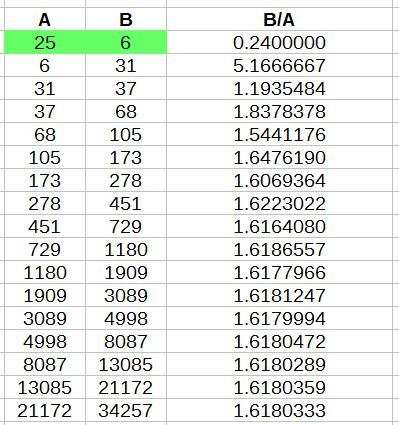 Locations of points are in a format (x,y). X holds the distance on the grid the point is in a horizontal direction. Y holds the distance on the grid the point is in a vertical direction. This point’s address is (5,9). Suppose the marks on horizontal and vertical lines are inches. As stated, the value of X is the number of inches a point is to the ‘right’ or ‘left’ on the horizontal dimension. The value of Y is the number of inches each point on the line is ‘up’ or ‘down’ on the vertical dimension. 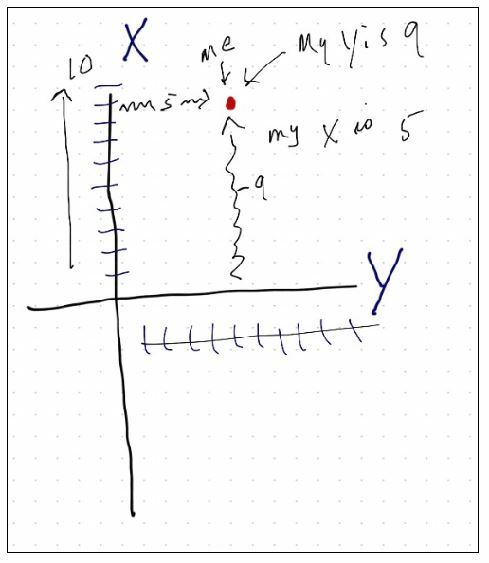 Points on the grid can be located by an equation. Here is a graph of a mathematical equation of a line. No matter how far the above curve is extended in either direction, it never contacts the boundary lines as you can see so clearly in the picture. This curve would have certainly been a favorite of Mr. Zeno were he around to see it. Here is how it proves itself to us. Every point on the curve has a mathematically computed location on the horizontal direction, and the same point also has a location on the vertical direction. The equation ‘tells’ the curve what to do. For every point it provides the X address and the Y address. A little like when a new road goes in and the post office assigns all the addresses on the road at once. In this particular road graphed above the post office decided that each house (point) has an address where whatever the first number is, you divide it into 2 to get the second number. I just picked 2. It could be 3, 5, a thousand, but 2 makes an easy one to show. The equation for this is XY=2. It can also be expressed as Y=2/X. You can pick an arbitrary ‘X’ number – how far to the right you want to have the point. To get the corresponding ‘Y’ number you divide whatever its X is into 2. See the table below to show this for a bunch of points. So if we pick a point 5 inches out horizontally, then we calculate the vertical point of the point 🙂 by 2/5, which is 2 fifths of an inch. This is because Y = 2/X, per the post office’s required calculation. For this street, this is just the way you do it. And address has to have 2 numbers to find it; where it is horizontally and also where it is vertically. So the point that is is 5 inches out is 2/5 inch up, AKA .4 inches vertically. The equation, like the post office, has the power to pick out or provide the address of EVERY house on the road, or every point on the line. Or, you could speficty the same rule this way “Vertical Inches = 2 divided by horizontal inches”. Same same. The post office doesn’t care how you compute it, so long as you follow the same rule, no matter how you say it. When we know the rule (equation) they use for this neighborhood, all the house owner has to tell us to find him is the rule, and ONE of his numbers, either vertical or horizontal. But we have to have both numbers, so, knowing the rule, we must compute the other number to find him. The rule can work both ways; give me your horizontal, I’ll find your vertical. Or give me your vertical, and I’ll find your horizontal. It you are going to someone’s point (house) for, to, say, find god there, the owner may say, “In our neighborhood the rule to find us is X times Y=2. My X is 6. Or he can say, “My Y is 3!” You can compute the other. Of course, he could give you both numbers, but if we can find god at his house, we don’t mind doing a little math. So, never mind, just go with it, the math is done below. over one million inches and up two millionths of an inch! Do you see what is happening? As we go ‘over’ more and more, the horizontal gets bigger, and the vertical location of each point is getting smaller. A real huge horizontal measure gives a real small vertical location. We can pick any horizontal measure and find what the vertical measure must be and put the dot on the graph where the over and up inches intersect. Once we know the basic shape, we can choose some locations outrageously far away (a million inches) to see what the curve does at extremes. Look at the graph and see how when you go ‘far out’ horizontally you get very close to the horizontal boundary but can you see it can never, ever touch it? The bigger the big the smaller the small. And that’s it, it can’t do anything else. It’s far out alright, and as it goes far out it goes far in. We are spending a lot of time on this just because it’s so cool. And it shows us something very simple and interesting about the universe. If you already know this kind of thing, you can skip all the math, but you might want to ponder the result with me. The curve can become very very close to the vertical boundary, and very very close to the horizontal boundary, within quantum distances, and it cannot touch, or it wrecks the very simple math of division. And division hasn’t been wrecked since 3rd grade, has it? You don’t have to be a geek to appreciate all this. It’s just division! It’s quite wonderful, actually, and quite mysterious isn’t it? On this particular matter do the math people and the mystic guys shake hands? I googled ‘math and mystics’ and did not find anyone, but I’ll bet they are out there. If we had one of their X addresses, we could find their Y, so their house, if they published their neighborhood post office rule. Does the horizontal boundary exist? It can’t be mathematically touched, when it goes into quantum distances and bumps into Heisenberg (actually can’t ‘bump into’ Heisenberg, sorry, because nothing can really bump into anything). Where all bets are off, does it matter if the boundary is there? At least by the method of an asymptote, it can’t be proven that it’s there. In fact, doesn’t the point we are plotting when it gets quantum close go anywhere or everywhere, just like the pendulum. Since we can’t know where the point is, how can we know where the boundary it is approaching is located? You could assume as we see an address ‘converging’ on a line but never touching, that this line is the ‘boundary’. But isn’t it kind of a leap of faith? Are we not rather jumping ‘over’ the quantum distance between the assumed point location and the assumed boundary location? We don’t usually take math on faith, but if we can’t show no address ever touches the line we call a boundary, what is our assumption that it doesn’t? Bit of a ‘leap’ is it not? A very, very, very tiny one to be sure, but a leap nevertheless. As close as the curve can get, we still jump off it and catch hold of the ‘boundary’ it seems to be going for. Let’s not think about where Zeno would say we go when we push off. It’s pretty obvious anyway, is it not? This is hugely simple math, it’s just division, and like my friend said, “It’s so simple, it eludes me.” Where’s the point? Where does it go? What is the point? What if we go to infinity on the horizontal dimension, how close does the point get to the X boundary? What is 2 divided by the number bigger than any number? It is smaller than any number, is it not? And what could this mean? Does the point vanish? Does the boundary vanish? Do they both vanish? For the point to ‘touch’ the boundary, one of the addresses would have to become zero, yes? But it never becomes zero. It gets infinitely close, whatever that means. It logically can never touch. Reminds us a little of Zeno’s arrow never hitting? Imagine an infinitely sharp needle moving across the surface of a perfectly smooth tile towards a second similar tile adjoining the first. When it reaches the boundary between the two tiles, if the needle is infinitely sharp, at some point it must not be able to rest on both sides of the two tiles at the same time. A blunt needle could touch both at once. A needle infinitely sharp would fall through. Even if the tiles are infinitely smooth, these two infinities collapse together and fall into a place where the boundary between the tiles is nothing. Our needle could never be on the boundary. If the tiles were infinitely close, whatever that may mean, and the needle infinitely sharp, I’m not sure anyone could say what happens, but it doesn’t sound like contact. The needle falls through into a nowhere that cannot exist. The boundary between our tiles disappears. Yet another place where boundaries can seem to exist, but actually cannot. The results of this innocent pastoral – spiritual farming? – musing have moved many from brain teasing to awe. Once the bunnies are all sorted out ,the way they reproduce gives rise to the following scheme. The site “Math is Fun” (really?) 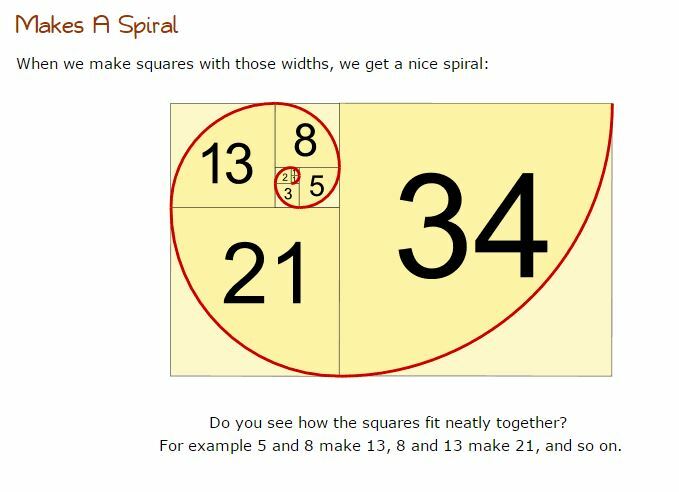 – http://www.mathsisfun.com/numbers/fibonacci-sequence.html –shows us how in a fairly short discussion. I am a wee bit troubled by this spiral business. It was hard for me to figure out how they draw the spiral, E.G. what is the rule of it. I finally see it looks like they are connecting two diagonally opposite points of each square with a smooth curve, and I suppose when you keep doing this square after square, you do get this particular spiral, with this exact sort of curving. Why they do the diagonals, who discovered this, and so on, I haven’t researched, but it does seem inescapable. For that matter, who decided how to place the squares? There seems to be a rule for that also. But for that matter, who decided to add up successive pairs of numbers? 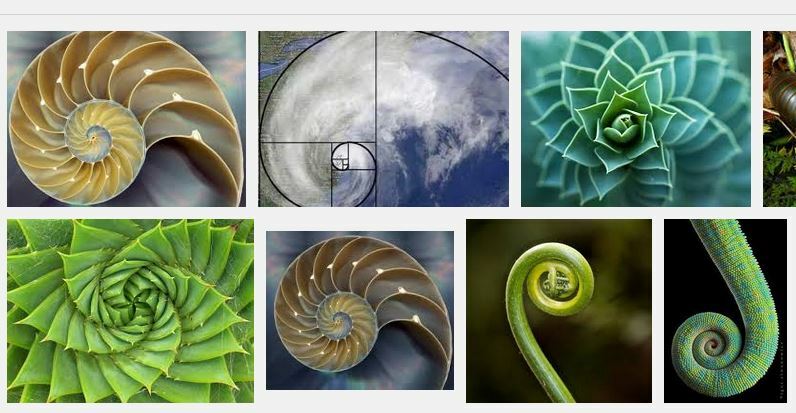 Well, Fibonacci. But for that matter, who disclosed the whole idea to Fibonacci? We just have to go with this. It came up. Not too interesting. But wait! What is happening in the rightmost column? Don’t we have something eerily like an asymptotic thing happening? Does this not look like the numbers are ‘converging’ on some value that looks like it may be a ‘boundary’? You can start with any numbers at all! And the second one doesn’t even have to be greater than the first! Now this is enthralling. The thing calmly resets itself and goes off to the races. And where does it race? Where does the sequence of divisions go? It seems to go to the same asymptotic ‘boundary’ the other one does. When writing this, I had to keep getting up and walk around the room. At first laughing, and then wondering, and then gawking. What exactly is going on here? A sequence of numbers, starting with any two in the universe, giving birth to a new number by a simple step, and then one more number computed from the two by another simple step (division), and no matter what starting numbers or how far we go, any set of starting numbers in the universe have their relationship – the divided pairs – go the same way to the same ‘place’. 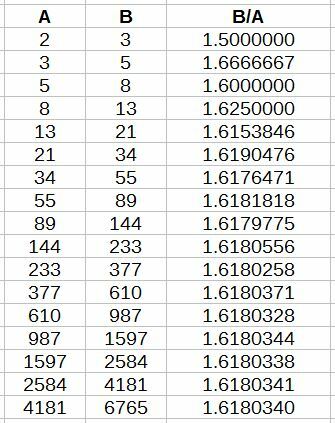 All ‘families’ of numbers seem to converge on the same value. Bunnies, amoebas, fruit flies, any natural pairing generational sequence, does the same thing. One man’s awe may be another man’s yawn, but for me, this inspires awe. For my purpose here, what’s significant is the boundary conditions implied by this reality. We’re not going to get into the debate about implicate order, whether this points to a universal intelligence or not, I’d like to examine the boundary implications of this sequence of quantities that is obviously very deeply and very inescapably built in to the very structure of manifestation. Bunnies, for goodness sakes have shown us the way. The darn thing is embedded, excuse the pun, everywhere. So here we go. 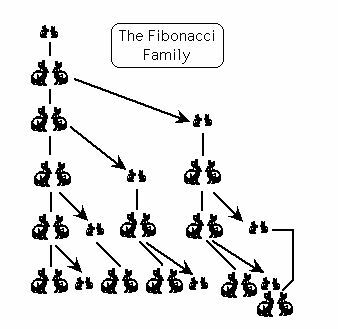 When it was noticed that the ratio of dividing two fibonacci sequence numbers in sequence converge onto a standard seeming value, this ratio was called the “Golden Ratio”. The golden ratio is said to be approximately 1.6618034. It looks like if we keep computing it, it will go on forever. Like Pi. So they just truncate it to a few places, even though, I submit, it is not any place at all, and we will come to that. Now we are can see the implications of the Fibbonacci number for a discussion of boundaries in nature. Somebody decided to graph the convergence of the Fibonacci Sequence Golden Ratio. Here is a picture. I don’t think I’m pushing the rope to suggest it looks a lot like our asymptote graph. Does the Golden Ratio value loom like a boundary in the same way an an asymptotic equation generates a curve converging towards a limit? The Golden Ratio graph is even simpler than the example for our asymptote. It’s just two numbers which come out of an orderly simple series, divided by each other. And we get this mystery. Look, another boundless boundary. No matter how far you extend this series, the lines get closer and closer to this ambiguous ‘barrier’, but can’t ever contact it. I wanted to unbind boundaries, but now that’s done, we need to go back to the Fibonacci spiral for a minute. And suddenly fascination turns to divination. A really very simple step of mathematical playing around turns up a pattern at the very core of the world. It manifests magically a picture of how nature grows. And it’s gorgeous. It’s abstract, concrete, simple, beautiful, and everywhere. You can make your own list; sunflowers, snails, cabbages, and it goes on. Why? Why is it that adding two numbers and then dividing the resulting two by each other, and repeating this, turns out a picture that is everywhere in creation, no matter what is being created? It’s a godwink, a “folks, heads up, everything’s beautiful, and connected, and abstract isn’t abstract, is concrete.” And more. A simple computation has esoteric effects. The Fibonacci sequence converges on a number that isn’t there. And at the same time hidden in this sequence is a wonderfully beautiful form we find everywhere in our natural world. Nothing is hidden from humans. In plain sight is a natural form that simple mathematics can demonstrate provide yet another brief that we and the universe are unbounded. A picture of the fun at the base of it all can be seen like I did one night. Boundaries are trying to tell us they are optional. Look deeply enough at anything and hints arise that they all merge into everything else because they are not really separated by “boundaries”. We don’t have to be quantum physicists to suspect it. But it’s maybe quite comforting that current physics endorses it. As I understand it, today no physicist certainly disputes Heisenberg’s uncertainty certainty. But we do not have to understand quantum physics to appreciate the examples above, which are from the world of ordinary thinking and the world of ordinary world. But why should we have to look at things suspiciously to see if they are really there? Well, can’t intellectual maturity be defined as learning to look beyond appearances? Can the same be said of spiritual maturity? We are not here to remain spiritual infants. We are here to see. There are mysteries only to make us grow up. And the time of mysteries is over. Everything we wonder about is hidden in plain sight, and we can see a lot by simply looking as the Yogic prophet Yogi! Berra said. Or not. Nobody’s forcing us to look at anything, and looking below surfaces doesn’t mean the surfaces aren’t marvelous as they are. But humans are beings by definition unsatisfied. We can look at the astonishing human curiosity at play in the mathematicians who looked deeply into number sequences and realize we’ll never stop. Humans will never cease wondering. We’ll never stop inquiring, asking, pondering, what? Pondering, as it is often simply said, “What in the World is going on”? “The first time you find him, he is where you find him. After that, he is found everywhere”. In his delightful way of talking, he put the accent on the ‘where’, which maybe makes this abstract matter more concrete, as if he were indicating, god’s really just in where. Where is god? He’s where. Maybe we’re not to worry so much about the ‘every’ part of everywhere, since it raises this troublesome infinity thing. But “where”, we can visualize. Where is really here. He’s here, he’s here, oh, he’s here… Every place the eye falls a where is there. And, according to Maharishi then, god is there too. Here is where, there is where, every where a where where. Perhaps the biggest and most obvious matter is that insofar as we perceive a limit, there is much evidence that it is not there. And if God is everywhere, which many people can readily admit, they just can’t admit god is inside them, too, because they believe he’s outside of them, on the other side of a barrier witholding them from union. Not saying how we all got into this bizarre fix, but to follow that trail, you might want to look at religions. So then, if there are really no barriers, isn’t what we think of as a separation, actually made of the same stuff as everything else? How could it not be? If there are no boundaries to create an actual difference in status, in being, must not everything that exists be made of the same constituent? Isn’t the seeming boundary also composed of god substance, isn’t is perceived to be constructed of God substance, and then the boundary between me and God cannot separate us. Because it is also God. And then I realize that I am officially surrounded. And I am invaded by the infinite. I can’t get away from god if I wanted to. Reality rightly understood interpenetrates me with the ultimate, with the Supreme, with the deepest possible eternal regard, constant attention, with eternal love, partnership and delight. Given this astonishing and simply mind blowing finding, redemption, and prediction, and with those above understandings of boundaries as conceptually elusive, we can go on in the next chapter to look at ways that the universe creates also have implications for the flexible, optional nature of boundaries that seem to separate us from god. ThankYou Bill, very thorough! My logic can’t comprehend in the detail You formulated here, yet I do get the gist of it and I thankYou for all of this work, WOW!!!!!!! lord-a-lordy! where’d u come from? not only are u bright (sunshine bright, too), but you’re brilliant! what’s ur mensa quotient? i echo berni2004, above. WOW!!! oh, btw, i had a lovely time working with freeman dyson & a few other physicists for a coupla years in the late ’70’s. this treatise takes me back, & in. blessings and blessings with us all!